Hey gang, Valkor here. 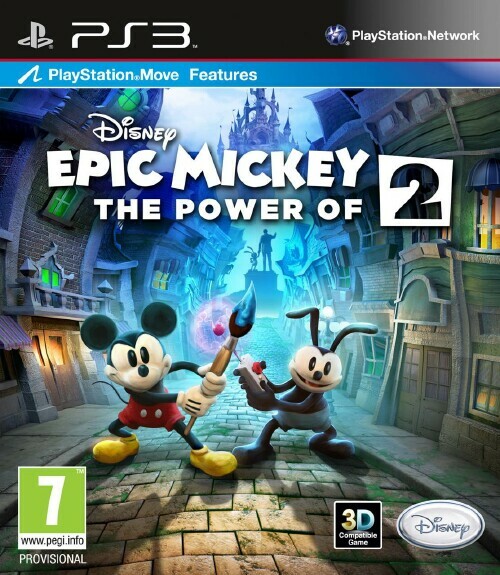 I really didn't expect to be reviewing this next title; I didn't play the first Epic Mickey, and from the reviews I read, it would appear that I didn't miss all that much. But usually with a games second outing, there should be some improvements over the first. 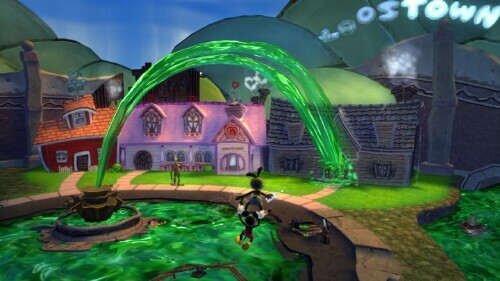 I'm not sure what they may be for Epic Mickey 2: The Power of Two (reviewing the Playstation 3 version), but from my perspective, the game could have used some ironing out. And yet, I had a pleasant experience with the game. Check it out! 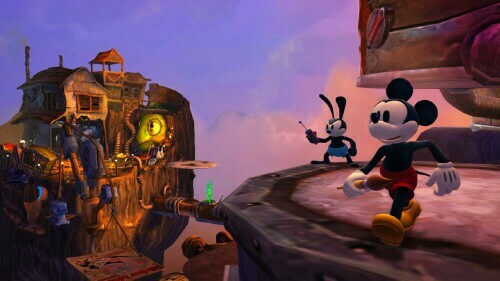 In Epic Mickey 2: The Power of Two, you play as Mickey Mouse as you return to Wasteland – home of forgotten toons, investigating a series of strange earthquakes and other goings on. He's brought back into the mix by the once evil, now turned good Mad Doctor, who creates a magical television, whisking Mickey along with his trusty brush, back to Wasteland to help save the land once again. Only this time he won't go the journey alone – hey, it's not called the "Power of Two" for nothing. 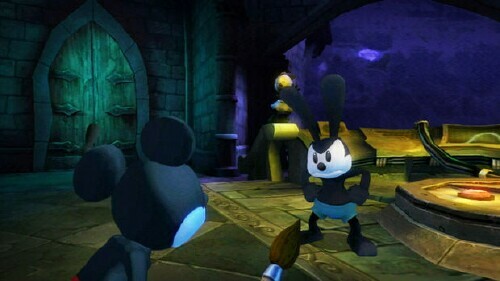 Oswald the rabbit tags along as a supporting character who can be either AI controlled, or controlled by a second player. 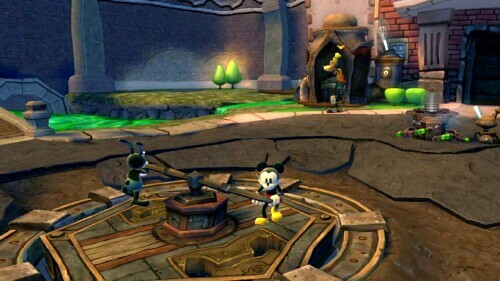 So along with the power of Mickey's magical brush, you get to use Oswald's remote control plus other abilities as you repair, repaint, and search all of Wasteland, to find out who's behind all the destruction. The game is a mix of 3D, with 2D elements tossed in, broken down into 3 episodes - once you get the projectors up and running, you'll be able to enter them as portals to other lands, traversing 2D planes to enter another portal that'll take you to your desired world. There's also RPG elements in the form of side quests, where upon completion you'll be given money (to purchase items/pins/upgrades), scrap metal (used to help with repairs our wasteland), cloth (used to make an assortment of costumes), and pins. As a single player, you control Mickey Mouse and his magical paint brush – you can use either the standard controller or the PS Move to enhance the experience. The brush has the power to create (paint areas and items that have been thinned) or destroy (thin out painted areas). Against a foe the painting ability can turn an enemy good or you can thin them out, eliminating them from the game. 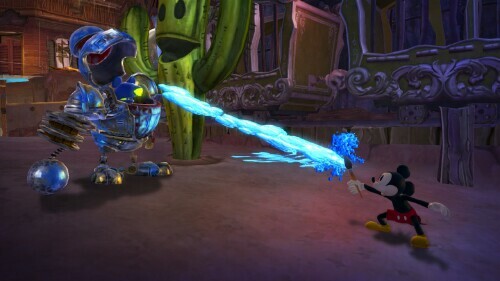 Mickey can also beat enemies with the brush and also bop on their heads (doesn't work for every enemy). 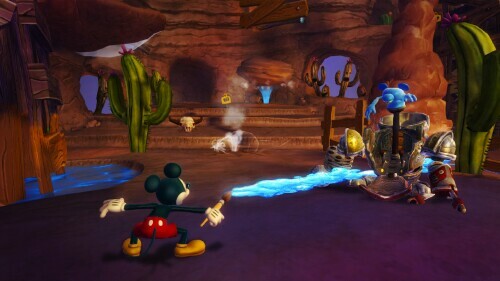 As Oswald (either AI controlled or a 2nd player), you have access to his remote control, which works similar to Mickey's brush in that it can turn enemies good or destroy them. You can also use the remote to create a protective electric shield, access special ports that can open up other areas or reprogram devices. Oswald can also fly for a short period of time or detach his feet and use them as a boomerang. Finally the game features choices you have to make that won't hinder you're progress if you don't complete them properly, but it may hurt your chances of doing any serious good. One big choice happens later in the game, when you enter Autoland; here you have the chance to free guardians trapped by a machine. The easy way is to step on the pressure plates and having Oswald reprogram the machine, causing it to explode, freeing the guardians. The more difficult way is to plug the vents causing the machine to bust open. I chose the pressure plates, but the guardians remained trap. So the easy way, isn't always the best way. But the hard way can be frustrating, yet very rewarding. 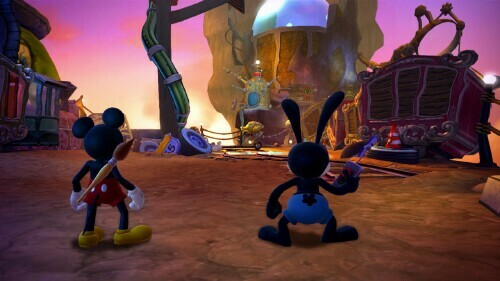 Rounding out the title, Epic Mickey 2 features a rich voice cast, musical numbers, tons of puzzles to solve, and great cameos. For some reason, the look and feel of this game reminded me so much of "Toon Town" from "Who Framed Roger Rabbit" that I almost expected Roger to pop out and shout "p-p-p-please!". If that had happened, I would have lost it! Anywho, does this game get a pass or fail? Let's find out in the TOV Breakdown. There's a lot right about this game and yet there's so much wrong it's not even funny. For one, I think the game should have gone straight up 3D, hop, bop, paint action (with the 2D platform elements). The side quests are fun, but you don't get much reward for completing them. And trutheshly? I ignored most of the side quest in favor of the main journey. I found them to be more of a distraction than anything else. Next up, the game could have used more enemies to battle against; as it stands, it's mainly you vs. the environment (paint this, thin that, repair this), plus a lot of walking. I'm not saying the game needs wave after wave of baddies, but it could have used a few more, here and there to make things interesting. Next are the controls; again I didn't have too big of an issue, but they're not perfect. The problem stems from the shaky cam for one, which makes it difficult to time jumps. And the jumps themselves are my next issue, which really could have used some work; you think you nailed a bop on a baddie only to discover you missed completely. And forget about dealing with platforms or large bosses; not entirely impossible, but it can get frustrating. UGH! Next, let's talk about the AI on Oswald. When it comes to secondary AI controlled characters, to me, it's a big deal that the AI is done right. The most perfect AI I've ever seen was in Marvel's Ultimate Alliance, where the computer controlled characters actually aided and fought with you. Here Oswald pretty much does what he wants when he wants. 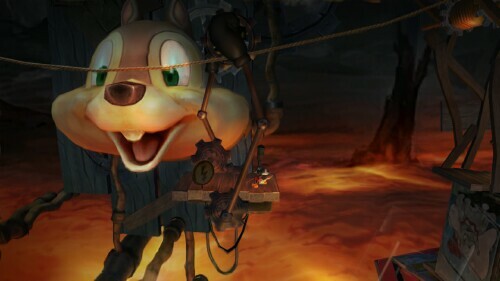 And if you call him, he might do his job (especially when the prompts are shown) or for some reason Mickey might toss him in the air, causing him to float for a minute or two, so you have to wait until he descends to attempt to do what needs to be done. It'd be great if you had that second person, but the AI should have been fixed. Finally, the game is never clear on what "exactly" you need to do at times. Sometimes you have the little Gremlin guy prompting you, but even then it's not quite clear on the objective. Sometimes you'll have to paint something in or thin something out to move on or to reveal an objective, but what exactly? Well that's based on trial and error. The way forward isn't always obvious so you'll have to try everything! 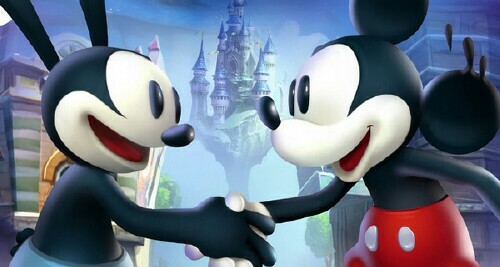 Epic Mickey 2: The Power of Two is available now on all platforms – Playstation 3, Xbox 360, Wii, Wii-U, and PC. And while it's not as "epic" as I'd have hoped it would be, nonetheless it's still fun to play. And out of TOV 5 stars, I'm gonna meet Mickey half way and give the game a 2.5 out of TOV 5 stars. Got something cool you want reviewed, an event to share, or a story you want covered? 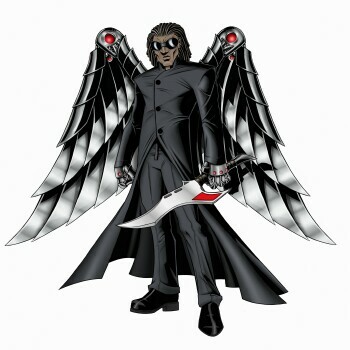 Just reach out to head honcho Valkor and we'll get you featured!